Here it is folks! 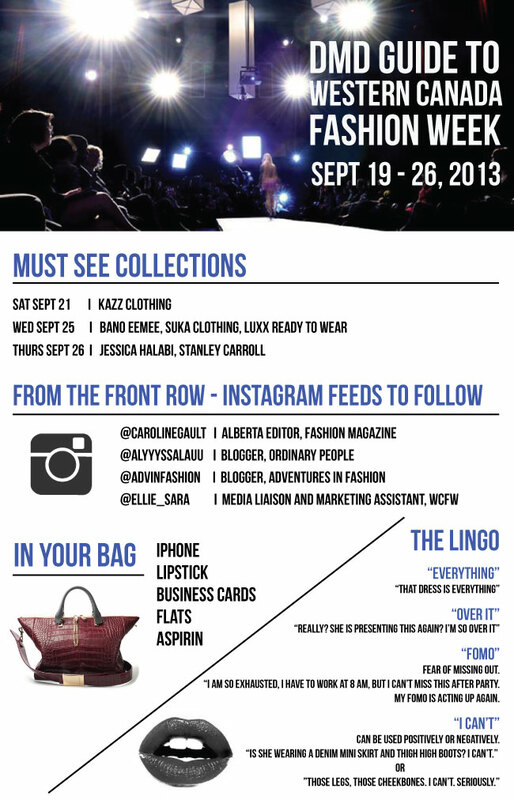 Dress Me Dearly's Guide to Western Canada Fashion Week for Fall 2013. Eights days of actual fashion insanity will hit Edmonton from September 19-26 and it can be hard to navigate through the madness. DMD would never steer you wrong, so check out my best tips for fashion week newbies. i can't wait :) thanks for the guide. i will surely be there!!!! love the post. will for sure use it. PS. I MET YOU AT THE FASHION INDUSTRY MIXER. YOUR STYLE IS AMAZING. It was so great to meet you! Thanks for coming to the PARK Fashion Industry Mixer and checking out the blog! I love this post! Especially "the lingo"!